regulate military jet instrument practice in civilian airspace to include much slower maximum airspeeds (i.e., if ATC cannot ensure that the route is clear of all other aircraft, then ATC must restrict the military jet to much slower speeds, as they would a civilian jet). There appears to be a developing trend toward more aggressive military training flying, with more impact upon residents below. This incident reveals the worst-case consequences of this trend. The ATC clearance issued by the radar approach controller to the F16 pilot is a matter of documented fact. It is recorded digitally, and the audio data is saved, by FAA. Likewise, the radar data used by the controller working the F16 just prior to the midair collision is also digitally saved. This data will show conclusively, where the actual collision occurred (the lat/long as well as the altitude), the flight directions of the two aircraft at time of impact, and what opportunities ATC had to ‘save’ the accident from happening. These digital files are immediately retrievable by FAA, thus have already been shared with NTSB. When Boeing 787’s had battery fires a few years ago, NTSB did a fantastic job showing the problem (with pictures of a burnt battery, no less) in a timely news interview. Likewise, when the Asiana flight crashed while landing at San Francisco, NTSB again was wonderfully transparent. We need this transparency, not only to help answer the reasonable questions and concerns of many citizens, but also to accelerate the ‘lessons learned’ from aviation tragedies, to help active pilots avoid tragic repeats. It has been three days, and FAA needs to post these files online, for the world to see the scenario that led to this tragic midair collision. Note the fix KREIS (upper red box), with a hard altitude of 3,000 feet. Note also the first speed restriction is at JCEEE fix, 4.4 miles after KREIS fix (lower red box). The lat/long for KREIS places it as indicated in red on the VFRmap portion. A left-turnout departure by a Cessna from KMCS to Myrtle Beach would approximately follow the green curve. The red line leading south to KREIS fix would approximately depict an arrival from Shaw setting up to fly this published procedure (i.e., a radar vector or a ‘Direct KREIS’ clearance). It is common practice for pilots to level off at the next crossing altitude (in this case 3,000 feet) at least a few miles before arriving at the fix. So, IF the arriving F16 was in fact being set up for this published approach, the pilot would have likely been screaming along, even in excess of 300-knots, and at a very low altitude of just 3,000 feet. Also, look closely at this published approach and it quickly becomes clear: with the annotations about ‘Radius to Fix required’ and very advanced (low) RNP requirements, this is clearly an approach NOT for regular GA flights, but most likely for military use. We do not know if the F16 was flying this approach or another. FAA can easily answer this question, as they need to do with no further delay. As a matter of practice, to best serve the entire public (not just the narrow interests of aviation), FAA needs to routinely and immediately disclose audio recordings, transcripts, and radar presentations that depict the facts, following significant aviation incidents such as midair collisions. Clearly, a timely internet posting at the FAA website would be both effective and efficient. It is also highly likely that the FAA controller immediately filed an ATSAP report. This program grants immunity to controllers if/when they have an incident, so long as they voluntarily report what happened. The controllers are not required to report all details, and being human, they tend to report a story that places them in a positive light. But, even with that, they do report important details, that need to be disclosed if the public is to understand the incident. Regrettably, FAA has gone to considerable effort to permanently conceal all ATSAP report content; i.e., the details reported are held in such strict confidence that FAA even tries to hide them from Judges. Despite the fact FAA could easily (and routinely) sanitize the report contents with minimal redactions (similar to the way NASA ASRS reports are slightly altered) and then immediately disclose the amended report, FAA refuses to do so. Thus, when people want to learn from tragic accidents that ATC failed to save, there are no facts to be studied. Instead, we have to wait until months and years later, when a fully sanitized and carefully coordinated story is released by FAA and NTSB. An Airbus A320, flown as JetBlue Flight 94 from Orlando, FL [KMCO] to White Plains, NY [KHPN], reportedly took evasive actions during the arrival, to avoid a collision with a small plane. The news story was widely reported four days later. Below is arrival portion of the route of flight, from FlightAware. 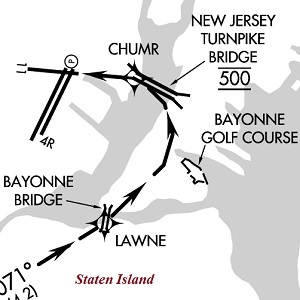 Note the flight-planned crossing of the midsection of Long Island and the box-shaped route over the Sound, apparently to transition through the flows in/out of KLGA and/or KJFK. If reports are accurate and the JetBlue crew did in fact take last-second evasive actions, this was most likely a controller error. And this does happen; controllers get bored or distracted. Or, they may be coming to work with deprived sleep, due to bad workshift planning, with compressed work schedules (though, many controllers ‘benefit’ from this type of schedule, by having what feels like a 3-day weekend every week). In any event, if there is any possible ATC involvement, NATCA and FAA will both encourage the controller to file an ATSAP report. Doing so grants that controller immunity for his/her error, meaning less re-training and less discipline. More importantly (to FAA and NATCA), filing the ATSAP report means the Public will likely learn nothing more about what happened here. Why not? Because in May 2014, FAA Administrator Huerta signed off on a new administrative rule that declared all ATSAP report data ‘fully exempt’ from release under FOIA laws. Now, not even the courts will compel release of ATSAP data. This change makes ATSAP effectively a ‘black hole’ for U.S. aviation safety data. Thus, no matter how diligently the media investigates this incident, FAA will refuse to release the real details, as reported by the controller. The departure was ASQ4100 (ExpressJet, callsign ‘Acey’); arrival was UAL1243 (callsign ‘United’). NTSB’s preliminary report, released on 5/15/2014, says the two flights passed at approximately 160 feet lateral and 400 feet vertical separation. At the time, winds were exceptionally strong, at 20-25 knots. This tends to mess up timing for the controller trying to launch Runway 4R departures through holes in the Runway 29 arrival sequence. On top of that, arriving pilots tend to bend the rules on the Bridge Visual Approach; they turn left early and thus compress onto the previous arrival. With enough arrival compression, the hole is no longer wide enough to time a departure … but the tower controller may not accurately judge this problem, especially in strong wind conditions. 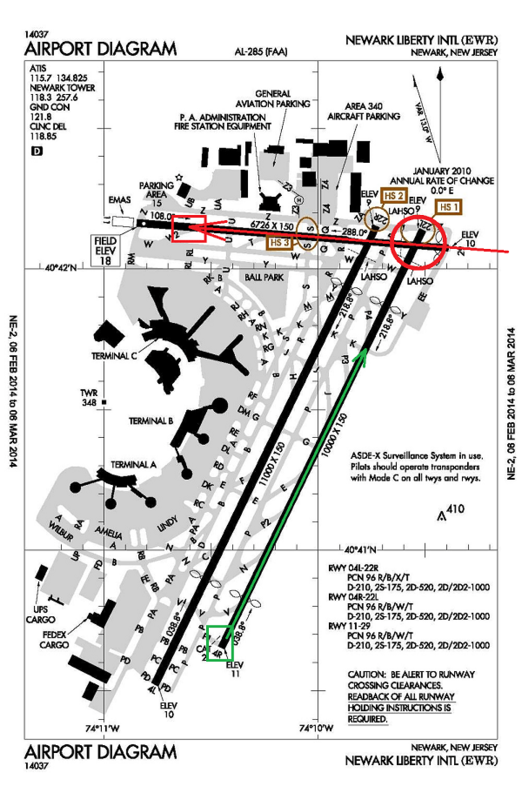 And so, the near midair happened when ATC launched a departure (green arrow) in front of an arrival (red arrow). ATC audio recordings indicate the conflict was identified at the last second, causing the departure to tip the nose down and stay under the arrival, which was proceeding to abort their cleared landing. Thanks to online aviation websites, the details of this near midair collision are accessible to passengers and the general public. Fundamentally, the problem that leads to near-collisions like this is the over-scheduling at super-Hub airports like KEWR. FAA proves yet again they lack the will to apply their supreme authority to run a safe system. They let airlines like UAL-COA schedule way beyond the practical safe limits, then just shove it upon the controllers to deal with it and keep it flowing, when runway projects force a normal parallel runway operation to become a dicey crossing-runway operation. All it takes is for the controller to fail to see one arrival while timing the departure, as happened here. This is a systemic problem within an agency that horribly misapplies its abundant resources. FAA places too much effort into shutting down low altitude UAV’s, beating up its few remaining Whistleblowers, PR’ing the facts to hide their many failures and coddling congressional animals (to enable their perpetual reelections). More often than not, FAA’s efforts toward safety are just for show. I would appreciate your professional assistance to ensure appropriate FAA action to resolve a safety failure at the FAA tower in Camarillo, CA (KCMA). This concerns a documented ATC operational error (OE) that occurred on 7/25/10. This error had three ATC witnesses, including a supervisor (FLM) who failed to act with the required report. Perhaps the larger problem is that this safety failure has gone unresolved due to an ongoing series of deficient investigative activities by FAA management, at both the District and Service Area levels. This matter was even shared with Mr. Foushee, but I suspect he just reflexively passed it off (which clearly was not the best move, considering the purpose of Audit & Evaluation). It is likely that you first became aware of this 7/25/10 KCMA OE via an 8/2/11 memo from Dianne Bebble, your subordinate at AOV-100. The subject of Ms. Bebble’s memo was ‘Report of Investigation: FAA Employee Complaint, Camarillo ATCT’. The memo’s five pages included a chronology of the OE and subsequent ‘investigations’; notes of the four interviews; a partial transcript from the ATC recordings; and a list of facts gleaned from an ATC tape and interviews of the KCMA personnel. The production of this 5-page memo required a visit by ATSI Mark McClure, who flew down from AOV-210 in Renton, WA, to perform the investigation. Mr. McClure heard the tapes, which were thoroughly consistent with the detailed account of a same-runway error, as provided by Ground Controller Mike Marcotte. Oddly, the two other witnesses (both of whom had a vested interest to deny any safety incident) had no memory; i.e., both the Local Controller (Mr. One’ Nielsen, who has since been promoted to be a supervisor) and the FLM in the tower (Mr. Pruitt, who has since promoted to a busier tower) had no information to contribute to Mr. McClure’s investigation. Based on these interviews, Mr. McClure declared the investigation was ‘inconclusive’. Please note, an ATSAP report WAS FILED by the Local Controller (Mr. Nielsen), but the facts within this critical record were not used (as they clearly should have been) to refresh the memories of Mr. Nielsen and Mr. Pruitt, and thus enable the conclusive analysis that ATSI McClure failed to produce (on his first try). I trust that you agree, this is not acceptable performance by FAA. I also assume that you were not aware of many of these details when they were reported (or not?) to you in August 2011. Frankly, in an organization as large as FAA, it is quite conceivable that information often gets filtered and/or concealed and/or misdirected. Thankfully, consistent with our Safety Culture, we can easily and quickly remedy these failures. For the record, the issues at KMEM centered on unsafe operations on intersecting runways which management was failing to report, while the unreported 7/25/10 OE at KCMA centered on unsafe operations on the same runway. There is not a lot of difference between these two air traffic safety failures. Both represent clear noncompliances with safety standards. Both represent events that, had just one more link in the chain been broken, they would have produced real fatalities when FAA employees failed. You are likely also aware that NTSB has included ‘Improve General Aviation Safety’ on their top-ten most-wanted list. This is largely due to the much higher accident/fatality rate for GA vs. commercial aviation. Indeed, thus far in 2013, we have already seen fifteen fatal GA accidents with at least 30 fatalities. At this rate, and consistent with past FAA safety oversight (which many believe is failing its potential to serve), we can expect roughly 500 aviation fatalities by the end of this calendar year. This is not acceptable. When our organization fails to identify controller errors, and thus fails to adopt better and safer practices, we not only put pilots at risk; we also diminish public confidence AND we demoralize our best senior controllers, while destroying the potential of our new controllers. 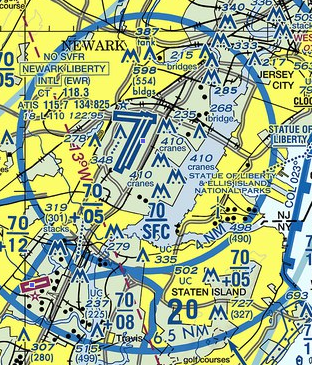 Mr. Ferrante, I suggest our FAA needs to be more assertive in preventing GA accidents. A good place to start would be to ensure that all GA operational errors, such as the concealed KCMA OE of 7/25/10, are fully investigated. Give those two supervisors amnesty if you must, but get them to tell the whole truth. It seems reasonable to expect that, if we promptly conducted an assertive investigation and subsequent report of findings to hundreds of FAA and contract towers, it would reinforce the importance of maintaining same-runway separation. It would also reinforce the importance of timely and open communications related to systemic safety failures. And, it might just prevent a real accident. So, would you please ensure this is done without any further delay? It would be so easy to resolve the ‘inconclusive’ status of the KCMA investigation by simply having one accountable official (such as you) actually read the ATSAP report and report its content. Thank you for your service, and please let me know if there is anything I can do to assist. It is my understanding that you are the Director of the Air Traffic Safety Oversight Service, AOV-1; further, that you report to Peggy Gilligan, who is the Associate Administrator for Aviation Safety (AVS). Please advise if any of this is incorrect and/or if there is another, more appropriate FAA official for this letter. I also understand you are a key FAA official behind the ATSAP MOU signed with NATCA. It is notable that there was no Local investigation. Two investigations were done belatedly at the District Level. First, in late September 2010, when Rolan Morel reviewed the tapes prior to their release under FOIA, and concluded there was no OE (though he never interviewed anyone, and his transcript erroneously added the word ‘turning’ to the taxiing arrival – you need to listen to the audio). And, second, in March 2011, when Jeff Cunnyngham did a phone interview of the Local Controller. A Western Service Area investigation was conducted in mid-June 2011; AOV-210’s Mark McClure flew down from Renton, WA, and conducted all three needed interviews for the ROI – a full eleven months after the safety failure had occurred. The key transmission was the ‘cancel takeoff clearance’ issued by Local Controller One’ Nielsen, when he recognized the arrival Cessna was still on the runway and being overtaken by the Cub departure on takeoff roll behind the Cessna. This clearly violates 7110.65 para. 3-9-6a and para. 3-9-6b. It is a measure of the lack of ATO cooperation that Mr. McClure had to obtain these tapes from the whistleblower, as they were not provided by local ATO management. Be sure to look at the details Mr. Marcotte provided at pgs.4-5. Thus far, the word of a credible and experienced controller has been completely ignored.